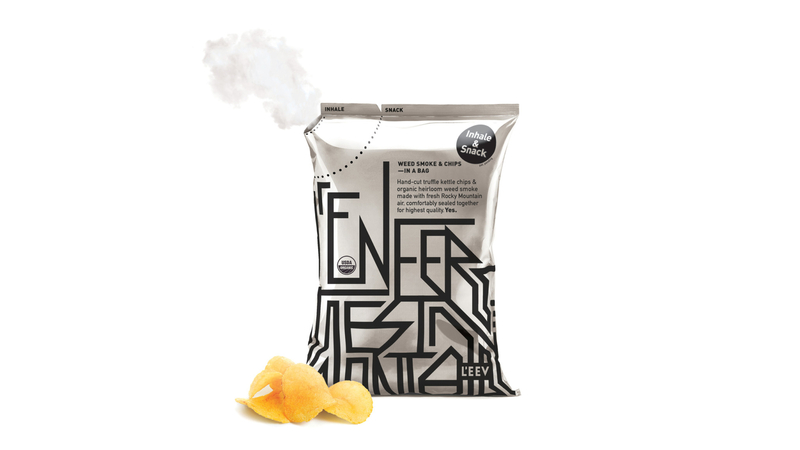 We created L’Enfer Est Volontaire, a line of chips featuring organic weed smoke inside the chips bag, to be inhaled prior to snacking. L’Enfer Est Volontaire, French for “hell is voluntary,” empowers the individual to take their destiny into their own hands in the here and now—or not. The package allows the consumer to first rip the small corner, to inhale the marijuana smoke, then rip the larger “snack tear”, to get to the delicious chips. Adding marijuana smoke doesn’t use any additional energy or resources in its supply chain than an ordinary bag of chips—the air is simply replaced by premium plumes of Rocky Mountain Kush. Aesthetically, the design doesn’t align itself with the long lineage of “weed graphics,” and the packaging isn’t meant to be appealing and appetizing in the typical “chips bag” category. We liked this idea so much that we secured the patent.